It is with great sadness that we announce the passing of Merton Ralph "Skipper" Sears, 72, of Springhill at the Cumberland Regional Health Care Centre on Friday, January 11, 2019. Born in Springhill, Skipper was a son of the late Kenneth and Kathleen (Macaloney) Sears. Skipper's favourite place to be was at the garage doing mechanic and bodywork. He was a member of the Springhill Fire Department for over twenty-five years. He sold Christmas trees for many years as well as having worked with Correction Services of Canada and the River Hebert Coal Mine. Skipper was an avid coin collector who could spend hours going over them. He was devoted to his family and friends and you would be hard pressed to find an individual or family in the Springhill area that he hasn't helped in some way. Skipper will be dearly missed by wife, Judy, of Springhill. Together, Judy and Skipper would have celebrated their 52nd wedding anniversary on Monday, January 14th. 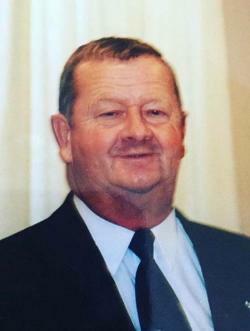 He will also be missed by three sons, Gordon (Terri) Sears, Amherst, Floyd (Caroline) Sears, Springhill, and Justin (Nikki Burke) Sears, Springhill; six grandchildren, Chrissy, Mackenzie, Kieran, Justin, Matthew, Kendra; siblings, Rosie (Gordon) Cotton, Shirley (Brian Smith) Fillmore, Debbie (Gerald Baker) Pettigrew, and Sidney Sears, as well as several nieces and nephews. Besides his parents, Skipper was predeceased by a brother, Glendon "Gump" Sears. Arrangements are under the care and guidance of A.H. Brown Funeral Home, 5 McFarlane Street, Springhill, NS (902-597-2361). A time of visitation and celebration of Skipper's life will be held at the funeral home from 2-4 and 6-8 pm on Wednesday, January 16, 2019. All are welcome to attend. Donations in memory of Skipper may be made to the Springhill Fire Department or a charity of the donor's choice. Sharing of memories and condolences may be sent to the family by visiting Skipper's online memorial at www.brownsfuneralhome.com or through the A.H. Brown Funeral Home Facebook Page.